As part of our Christmas celebration the children in the program and their extended family members came to the residence to receive food packages, presents from sponsors, other distribution items such as blankets and chickens, and each child was given new clothing and shoes. 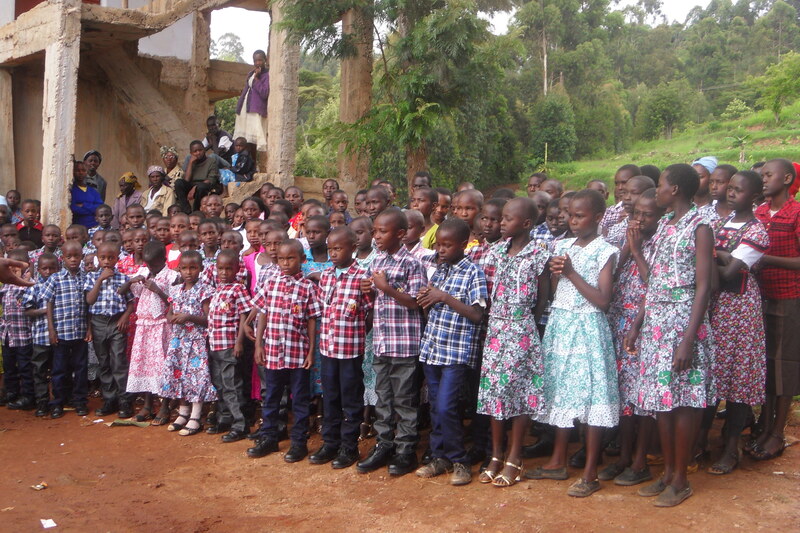 A group shot of many of our children in their Christmas clothing! 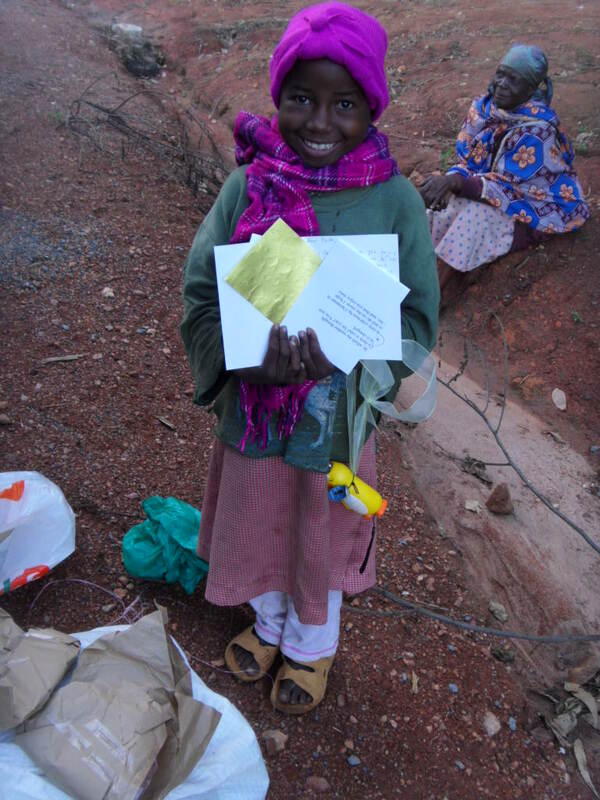 Although our monthly distributions are now mobile – we travel out to make deliveries to them rather the sponsored child and extended family coming to the compound – there will still be three or even four times a year when everybody will gather at the Rolling Hills Residence. These times of group celebration, and a shared meal, help to cement the bonds of all of those in the program. Our program has operated by using Ruth and Henry’s very old car and pickup truck. We launched an initiative to purchase a used vehicle – a 10 seat van. 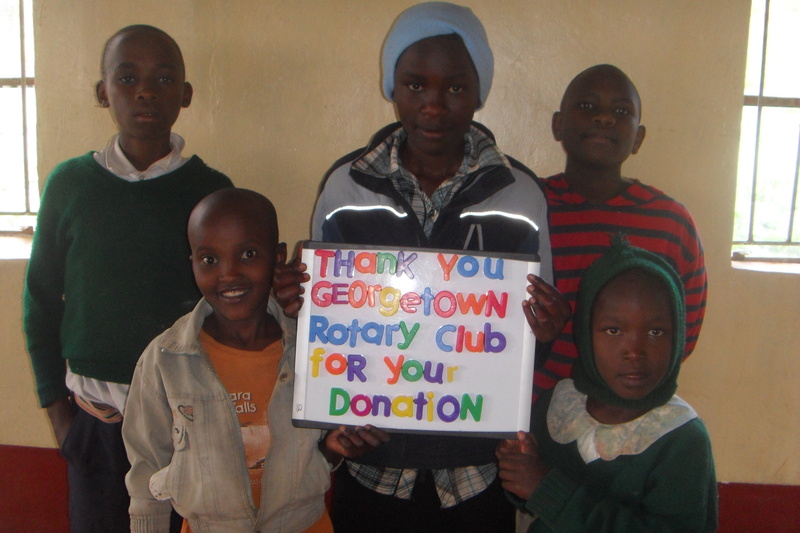 We presented to the Georgetown Rotary Club and they made a very generous donation of $1,500.00 to help purchase the vehicle. Special thanks to Barry Edington. We are hoping to expand this partnership with the Rotary Club in Machakos – the doctor who treats our children is a member and has offered support. The vehicle will be purchased in the coming months. 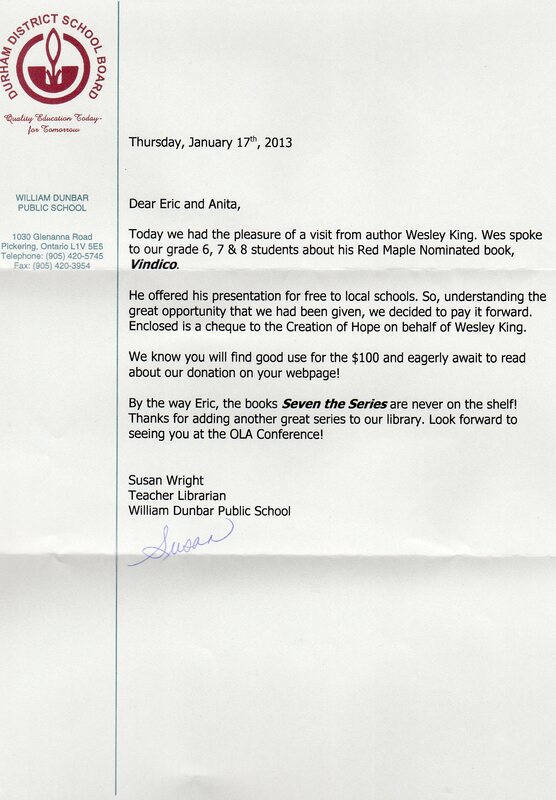 Our friends at William Dunbar P.S. made a donation for $100.00. 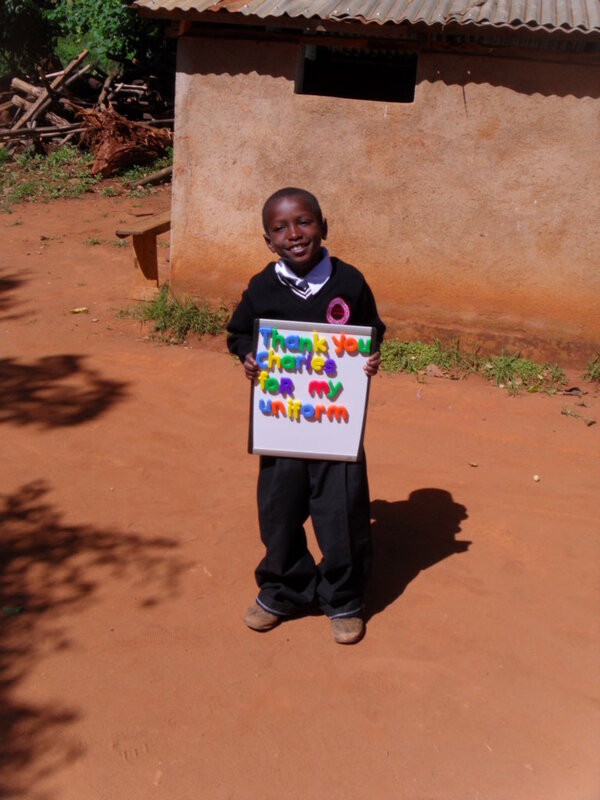 This donation is explained in the letter below and below that is the ‘thank you’ picture to show how we will use that donation. Thanks for thinking of us Susan! 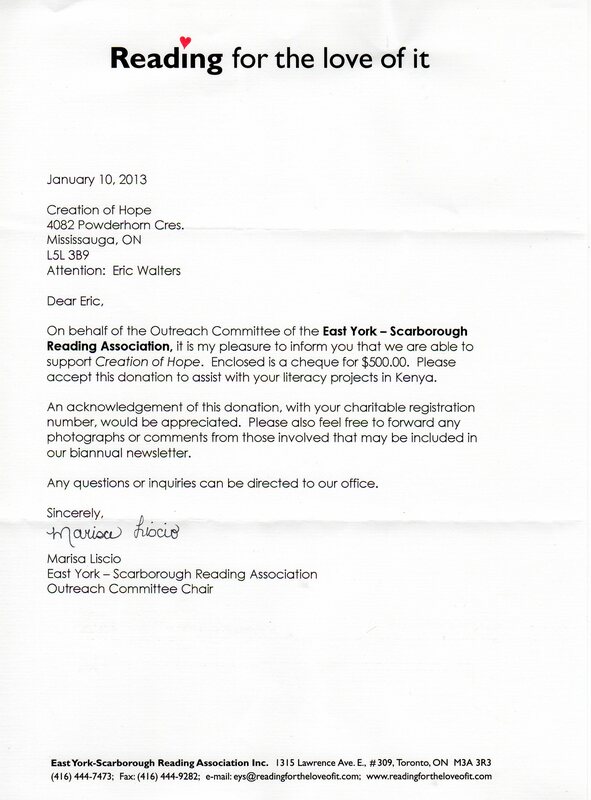 This donation is going to be used for literacy initiative in the program including books, chairs and tables in our new library at the Rolling Hills Residence. We will forward pictures once the purchased have been completed and the work done. Our friends in B.C. at Van Bien E.S. 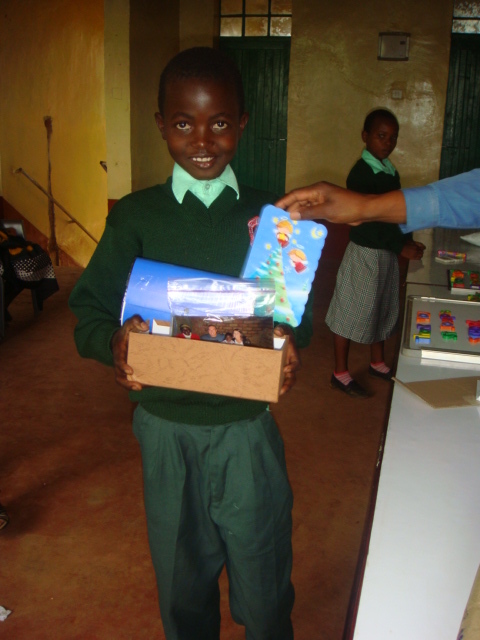 will be sent pictures of the items – and the children who receive them – over the coming weeks. Special thanks to Cliff Hall who is on our ‘waiting list’ for sponsorship but while waiting has made a monthly donation to go in our emergency medical fund. 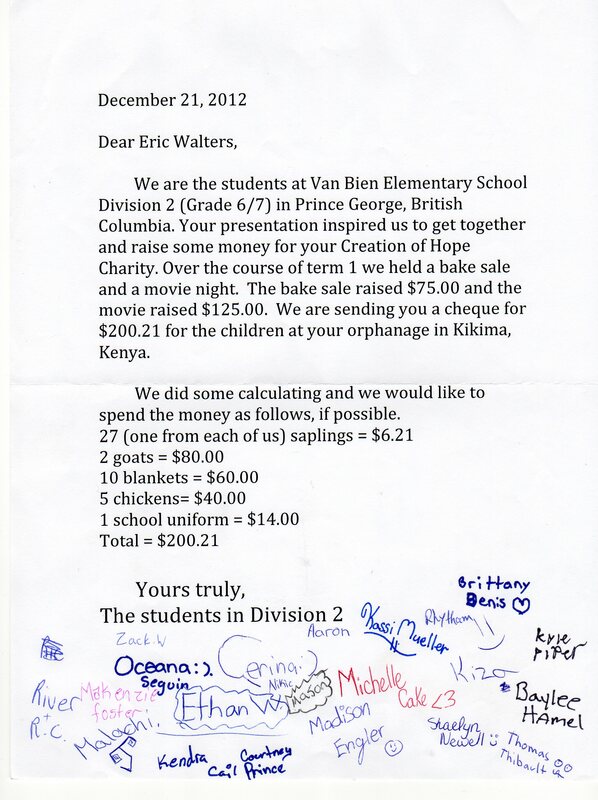 We received donations from Clarkson Secondary School ($170) and the Witty Kniters Club ($25) by making and selling sock monkeys. Thank you for taking time out of your busy schedule to come visit us here at Clarkson. 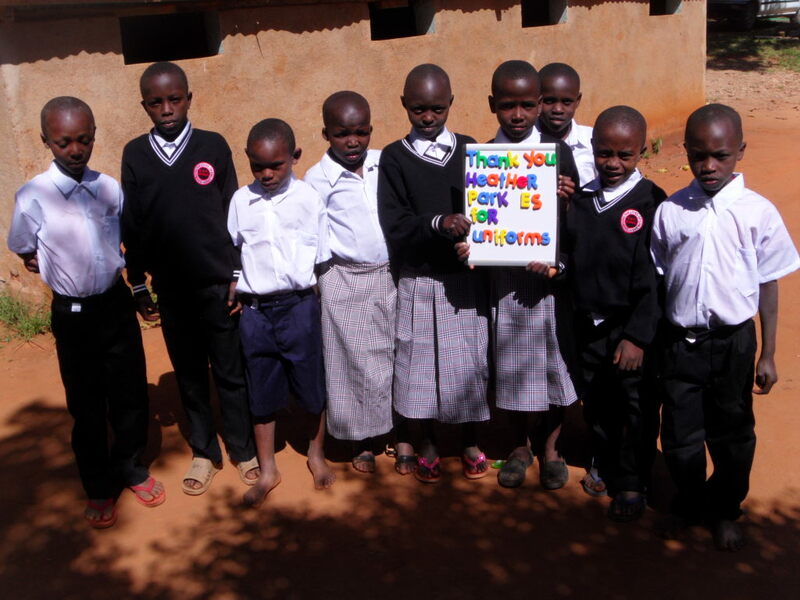 My name is Kalin, and on behalf of Mrs. Mark’s grade 9 English class, me and these other five students would like to present to you the money we raised for your Creation of Hope charity. It’s funny because last week we had to present essays on heroes, and I stated in mine that a hero is someone who selflessly sacrifices something for the benefit of others, and that’s exactly what you and your husband do. 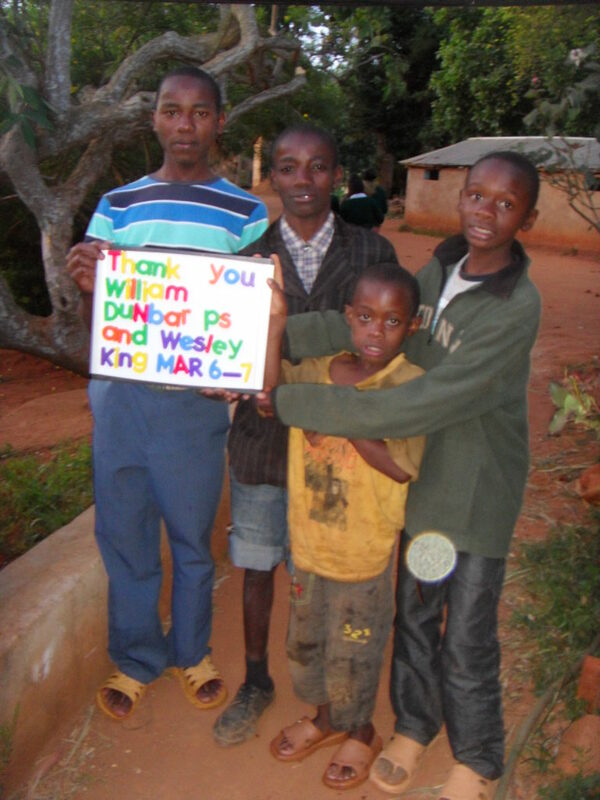 Thank you for being heroes to the children in Africa and role models to us. One of most faithful sponsors, Barb Kettle, has retired from her position as the teacher/librarian at Alexander Graham Bell. In her honor they collected $376.30 which Barb has asked to be directed toward tuition fees. Brett Walker forwarded a donation for $100.00 from a student at St. Pius who wished to remain anonymous. 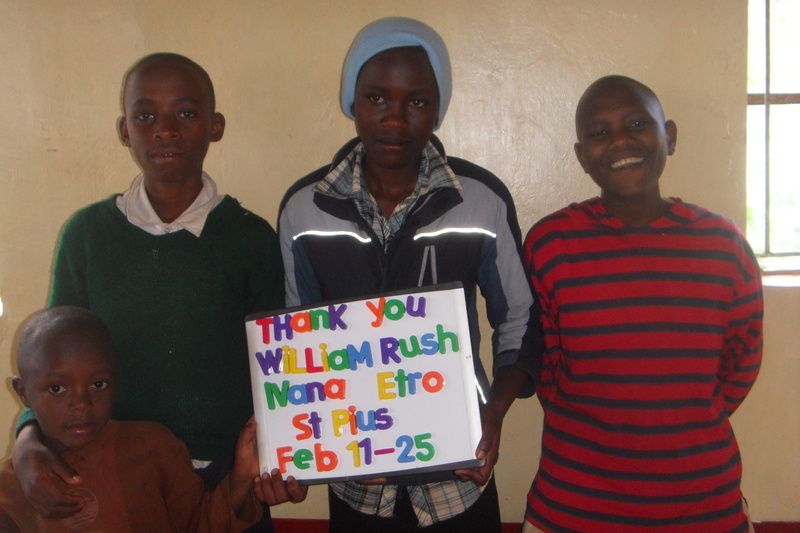 In the previous month St. Pius had made a donation of $750.00. Along with Brett Walker there were two people specifically to be thanked at St. Pius. I was at Mckinnon P.S. 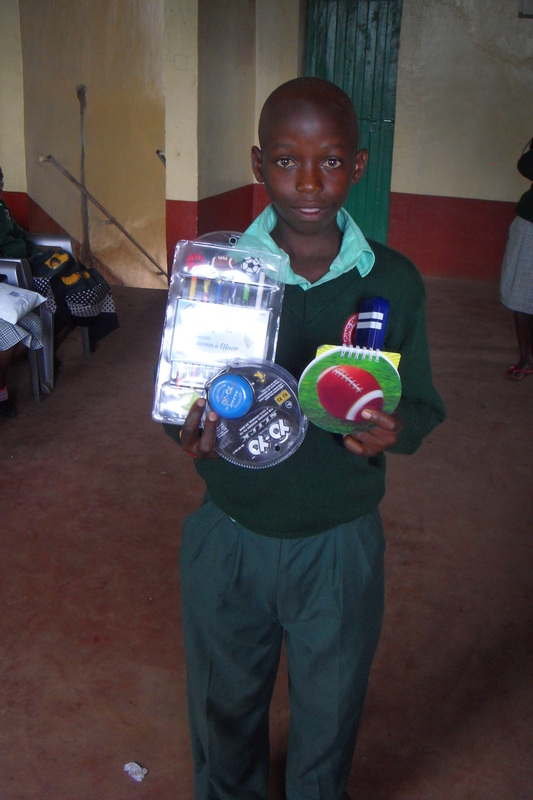 and two students, Trevor and Rahul donated enough to buy a blanket. 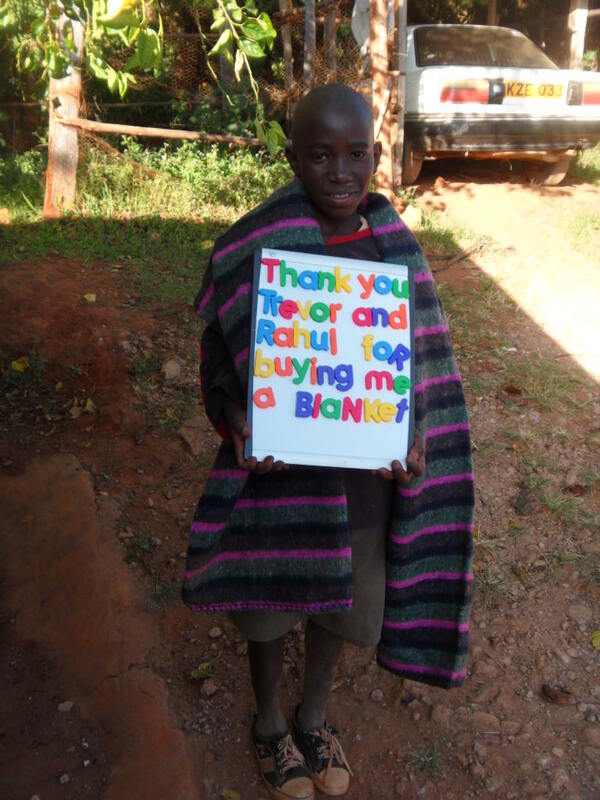 And here is Boniface with his new blanket! Early in the week at St. Bridget a student, Devin Fitzpatrick, came forward with a donation of $40.00 for a goat. I look forward to giving Devn and his family the picture of the child who will receive this goat. Students like Trevor, Rahul and Devin are inspirations to me. 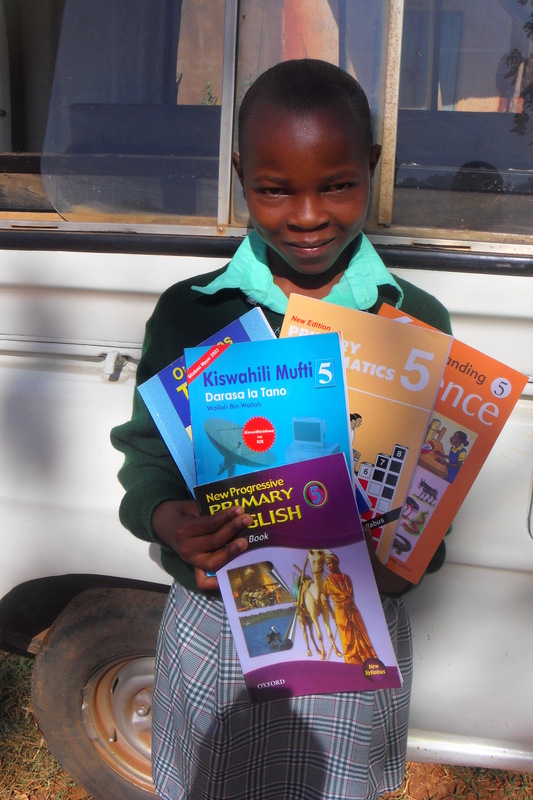 Our support from schools has also come from teachers. Stephen Obermeyer, a teacher at Rousseau P.S. 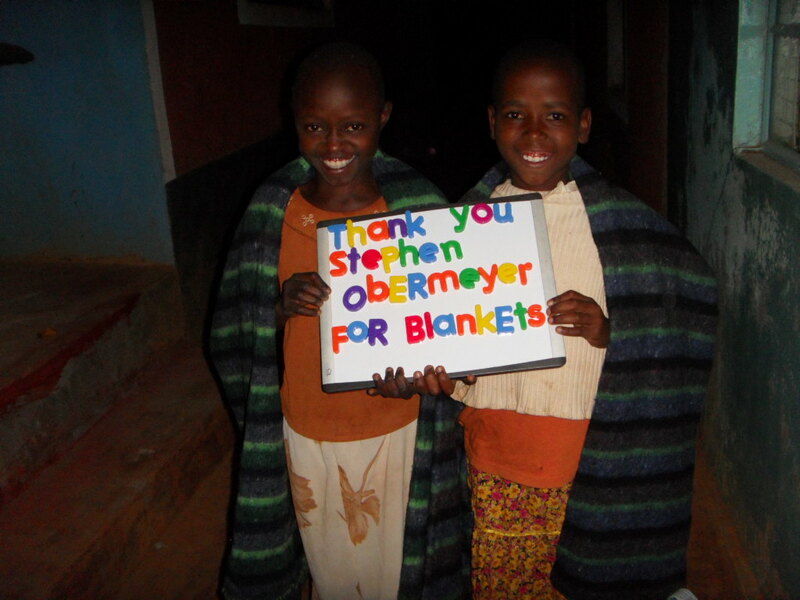 made a donation to provide a day of support for one day and two blankets. 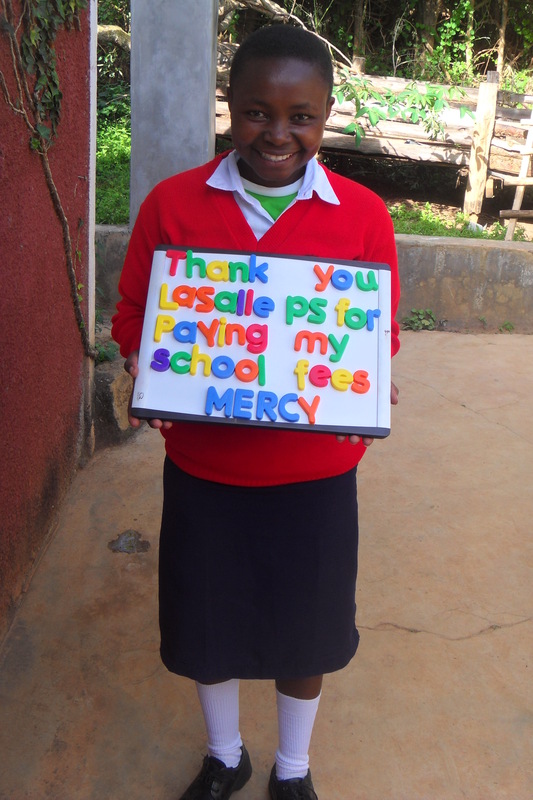 Krista Pettey made a generous donation to be applied to tuition fees. 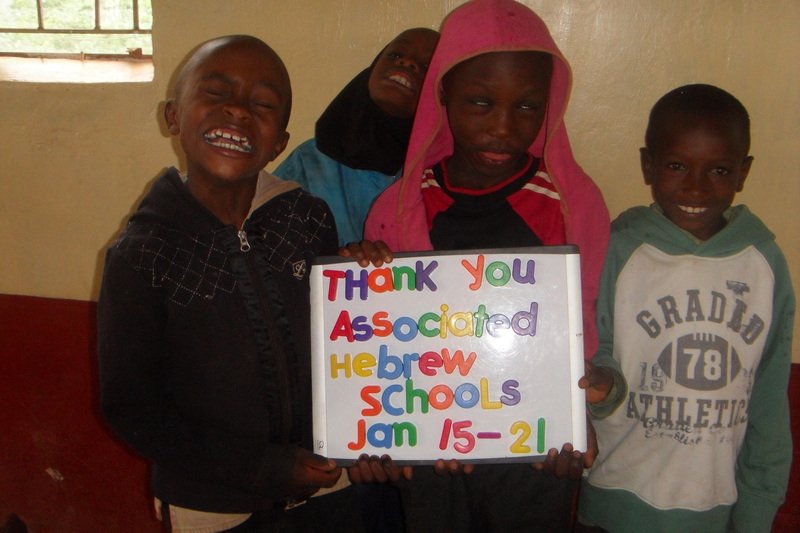 Fred Dawber is a sponsor in the program who is also a very generous supporter of special projects. Our well is named after the Dawber Family. 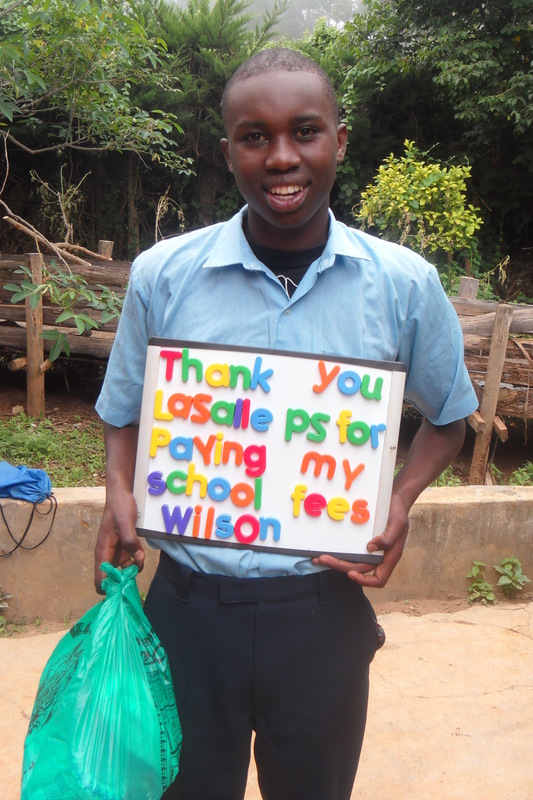 He made another donation to help with the piping leading from the well to the residence. Once again Sharon Freeman has made another donation. 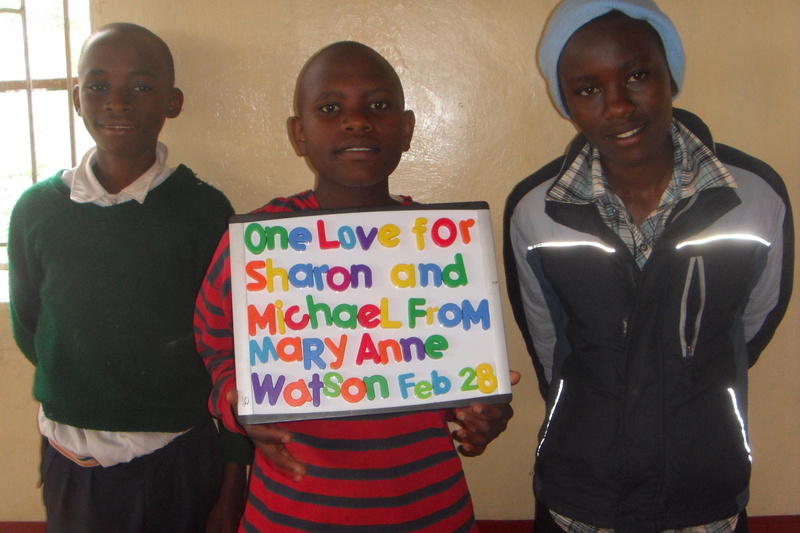 *** Mary Anne Watson Bonsall made a donation in honor of her friend’s (Sharon and Michael) marriage. 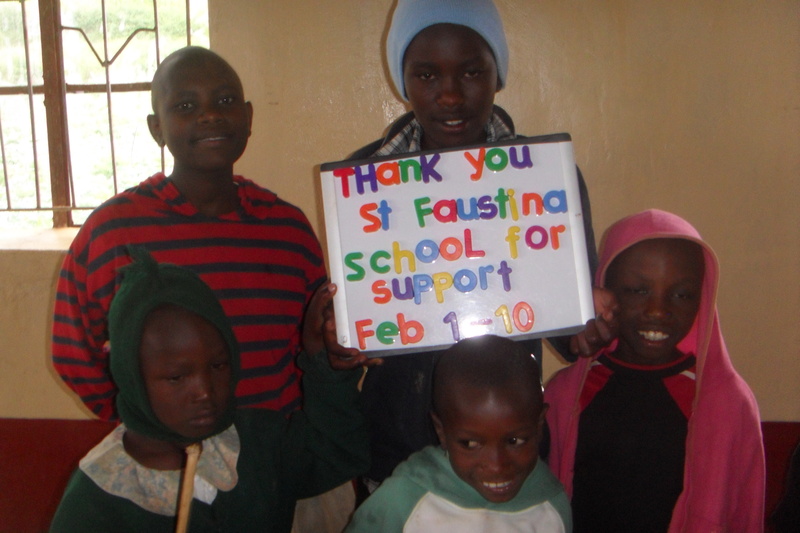 Support for the Rolling Hills Residence is ongoing from our generous sponsors. $50.00 provides the food for the children, medical treatment, school supplies, the salaries of the matron, night watchman and tutor, and the sanitation, water and electricity for the entire building for one day. School is technically ‘free’ for students from grade 1 – 8. 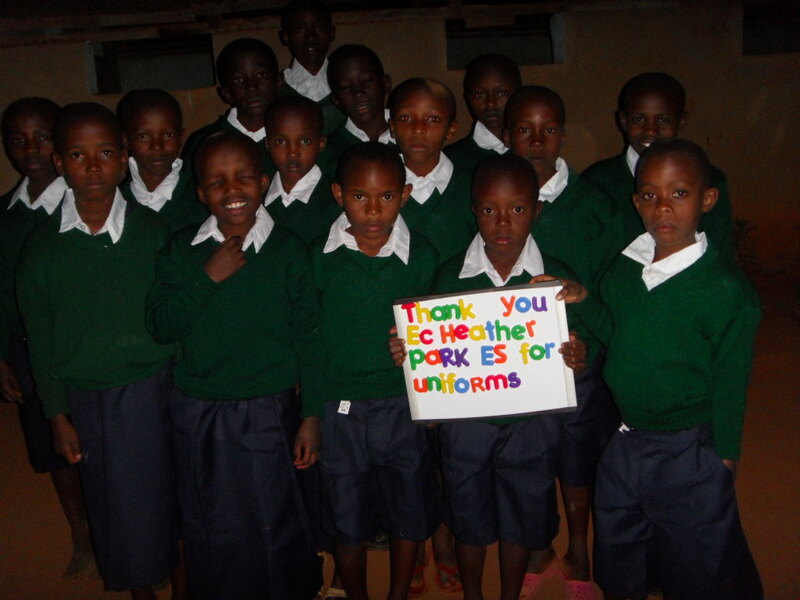 However without uniforms the children are not able to attend. While 1 – 8 is ‘free’, high school involves tuition. These fees are reflective of the level of school – local, regional or national with each level being more expensive. This year we have 24 students in high school. 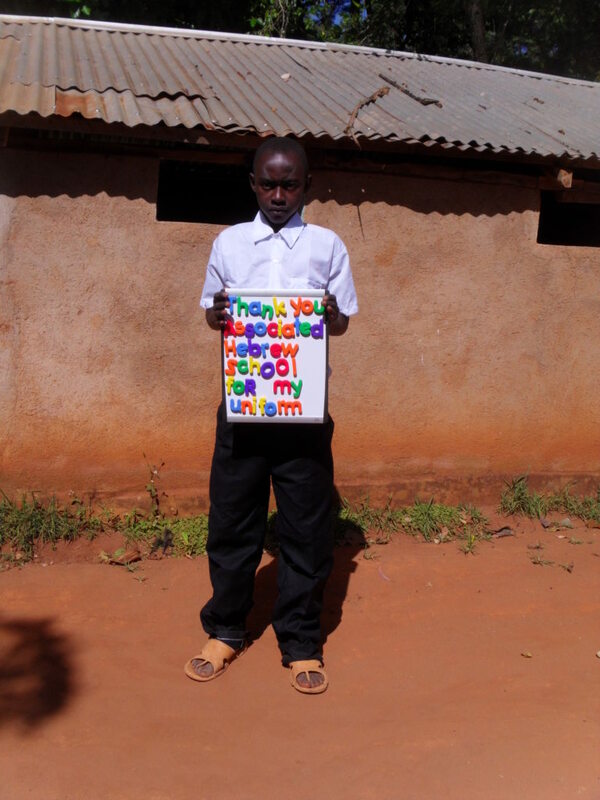 Some of the expenses are paid for by sponsors while other children are not sponsored – they are the siblings or cousins of sponsored children – and are needy students identified in the community but unable to pay, and lastly, some students we ‘inherited’ when another orphanage had to close its facility. 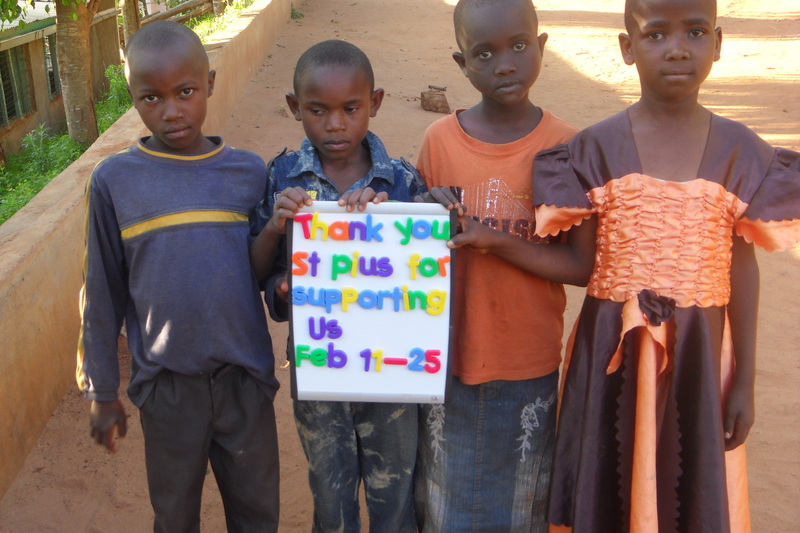 Here is a sampling of the thanks we gave out for this support. 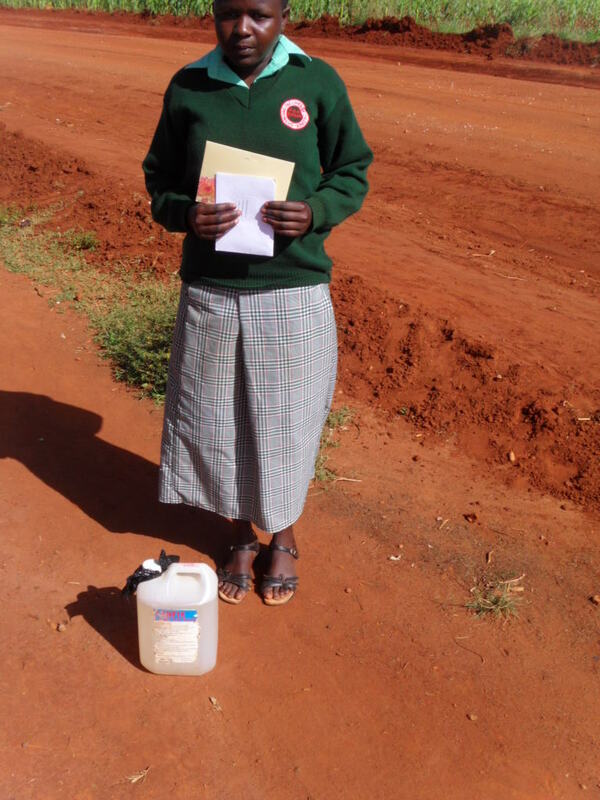 Mailing parcels to Kenya is expensive, takes a long time for them to arrive, and there is always a slight risk that they will go astray and never arrive. 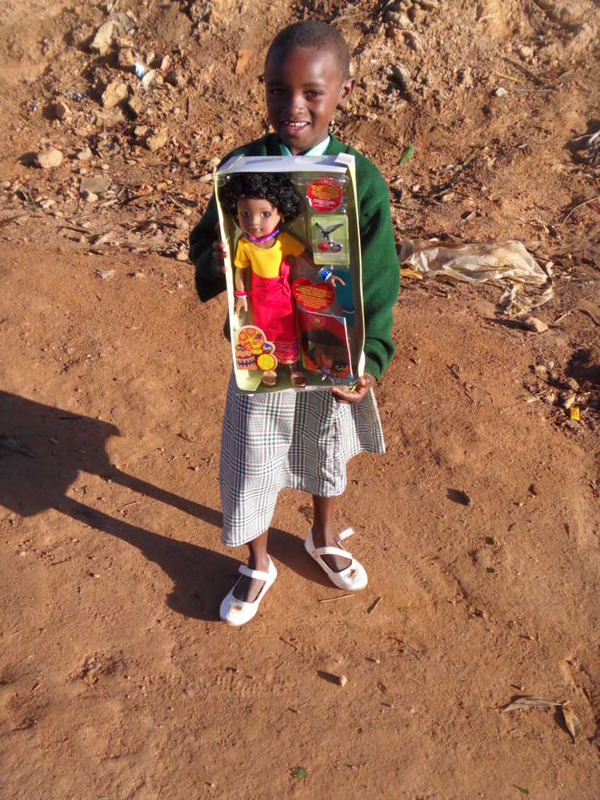 We try to send back a picture by email to the sponsor showing their child holding the things that were sent. Here is a sampling of those pictures chosen simply because they made me smile the most. 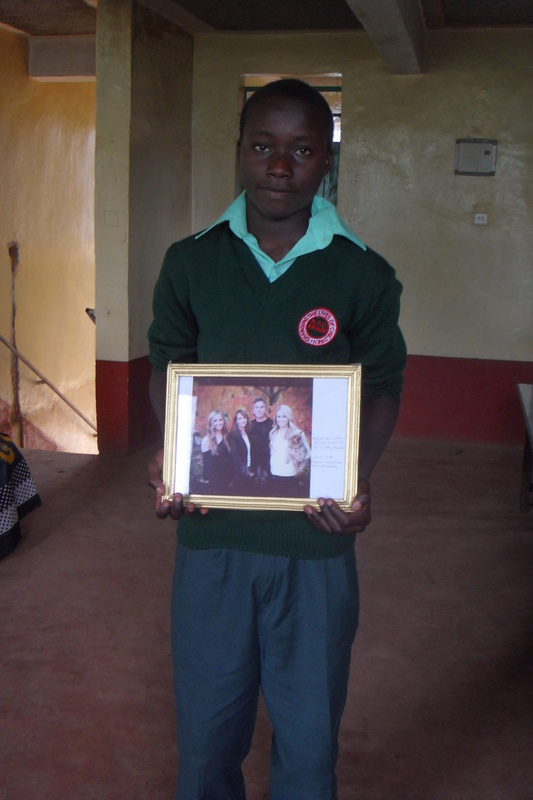 Chris traveled with us to Kenya this past summer. 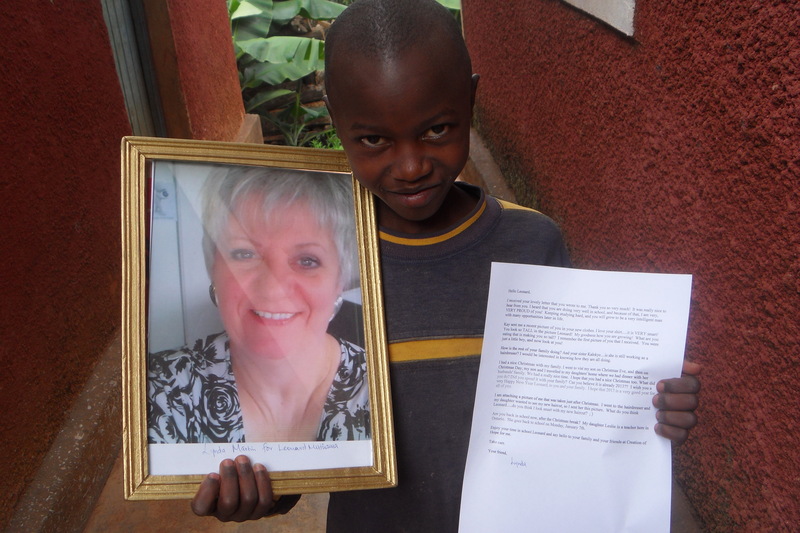 She was captured by the experience and made two decisions – to become involved in helping Anita and myself in the day-to-day running of the program and to sponsor a child. 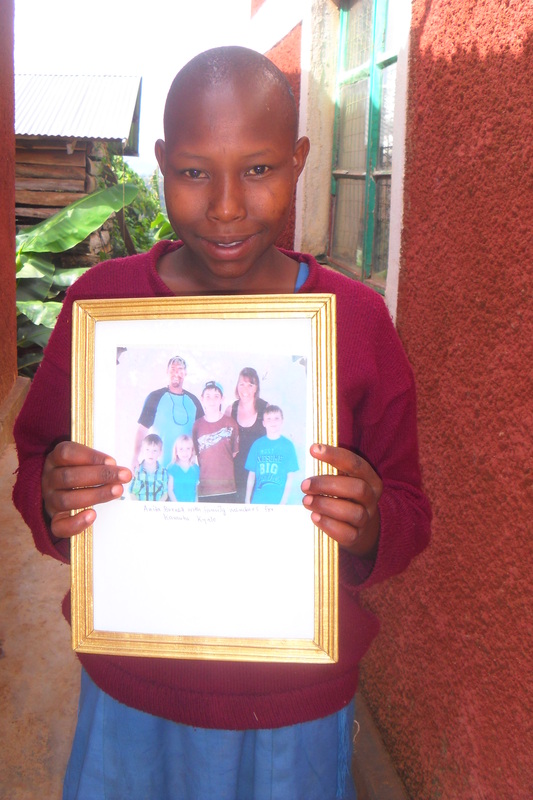 Here she is in the picture being held by her sponsored child Kelvin. Kelvin has recently moved to The Rolling Hills Residence. This was precipitated by the death of his beloved grandfather who provided for Kelvin, but also was provided for by Kelvin. I had met with his grandfather on many occasions over the years. He was a true gentleman, generous of soul, an elder in his community and will be missed. Already residing at Rolling Hills is Kelvin’s younger brother Eric, so in some ways this is also a reunion. 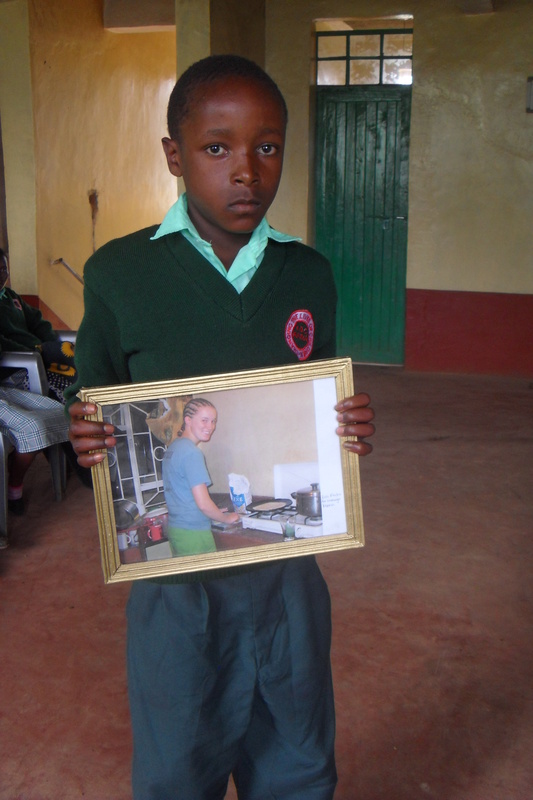 Lisa was the first volunteer to go to Kikima where she spent three months working in a local girls’ high school. 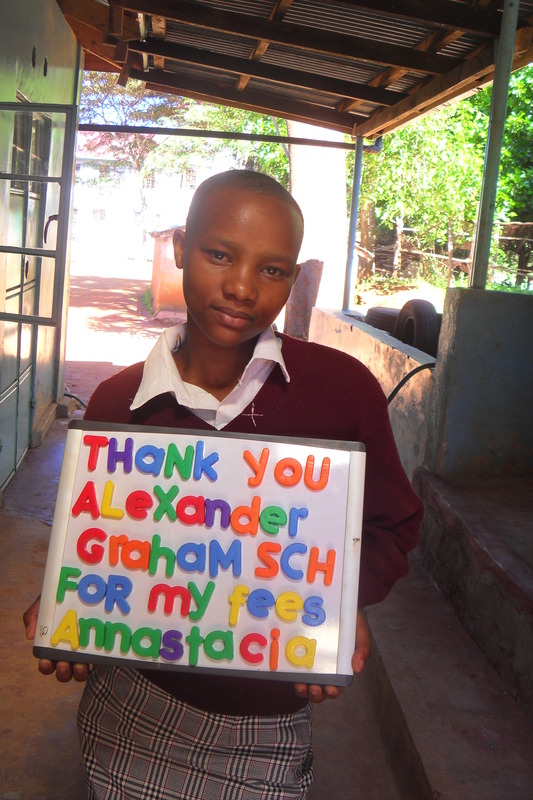 She has recently graduated from university and is one of our newest sponsors. 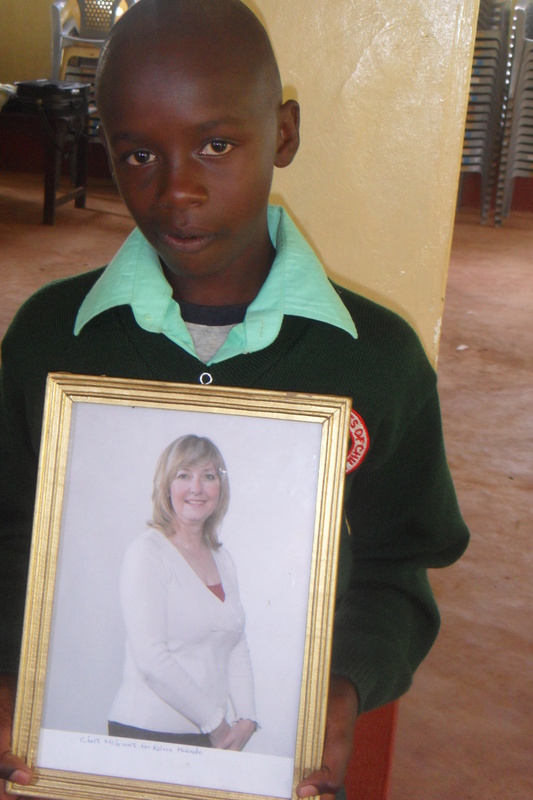 Her child, Mutunga, holds a picture of Lisa taken when she was volunteering. It should also be noted that Lisa is our webmaster and posts our monthly updates! 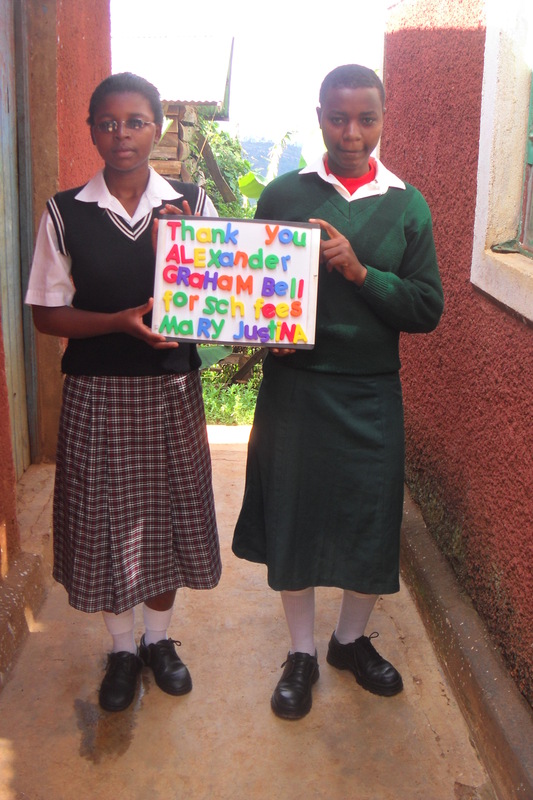 Mary-Anne has often made donations individually (see in first section) and with the students in her school and it’s wonderful to have her and her family as sponsors. 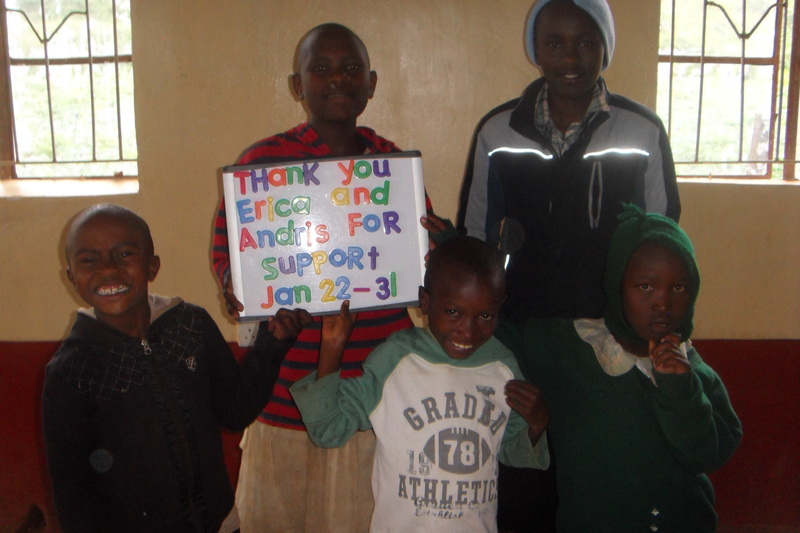 Anita Burnett and her family are our newest sponsors. We welcome them aboard and look forward to them forging an ongoing relationship with Elizabeth Kamutu.